Mega Sale! Save 27% on the 3 x No.1 Set: The No.1 Silicone BBQ /Cooking Gloves Plus The No.1 Meat Shredder Plus No.1 Silicone Baster PLUS eBooks w/ 344 Recipes. Superior Value Premium Set. 100% $ Back Satisfaction Guarantee by Grace Kitchenwares GK201 at Baking Love. MPN: GK 201. Hurry! Limited time offer. Offer valid only while supplies last. 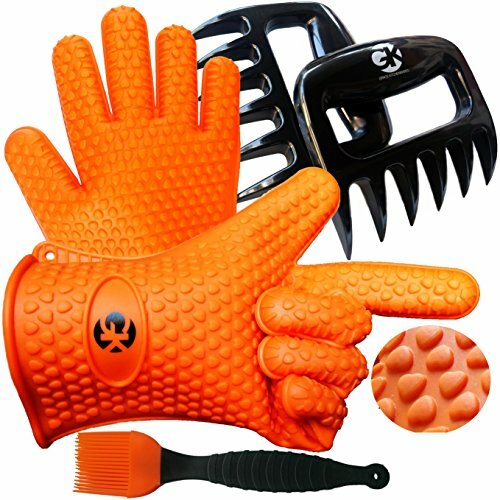 BBQ MANS DREAM SET - Make smoking and grilling more exciting and effortless with these 3 great tools for grilling, smoking, shredding, basting, lifting and more. This SUPERIOR VALUE SET of 3 Top Selling BBQ tools are functionally matched and very reasonably priced with 100% money back satisfaction guarantee. You have Zero chances of going wrong with a GK! NO MESS NO REST SILICONE GLOVES - The best thing about silicone gloves are them being food grade, water proof, stain proof and odor proof. That means you can go right ahead and pick up food and worry not about the hot juices seeping through to your hands nor the smell and odor sticking to the gloves. Just rinse easily and reuse them right away!! They come in pairs for maximum movement and function. Oh and they work great for frozen foods too! 3 EXCITING RECIPE EBOOKS- GK's "22 Exciting Recipes for GRILLING AND BROILING", GK's "22 Exciting Recipes for ROASTING AND BAKING" and "300 Recipes for The Grill". You will always have something new and interesting to try and to enjoy. ONLY THE BEST FOR YOU - We guarantee our Quality is at par with the very best but with added value and guaranteed quick response customer service you can depend on. If we don't answer in 24 hours, expect a gift from us! If you have any questions about this product by Grace Kitchenwares GK201, contact us by completing and submitting the form below. If you are looking for a specif part number, please include it with your message.